Charly is a seahorse and seahorses are also known as hippocampus and they live in tropical and temperate waters throughout the world. They are very unique fish, not only do they not look like fish in general, they also swim upright instead of horizontally like other fish. Another crazy fact about them is that the males give birth to their descendants. 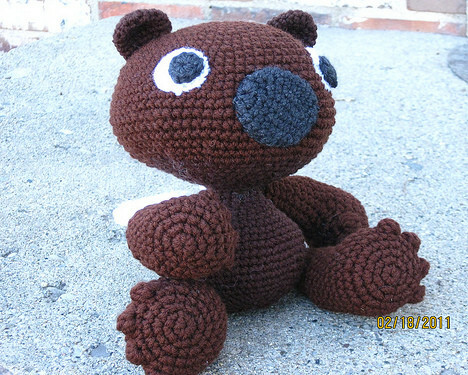 Charly is worked in classic amigurumi style, which means in a long spiral round, never join a round after finishing one. Also I like my amigurumi to be worked through both loops (whereas I know couple fellow amigurumi makers who prefer the back loop only). So do whatever you like best. I used catania yarn from Schachenmayr and my beloved 3.5 mm hook. My Charly seahorse is about 23 cm from top to bottom. 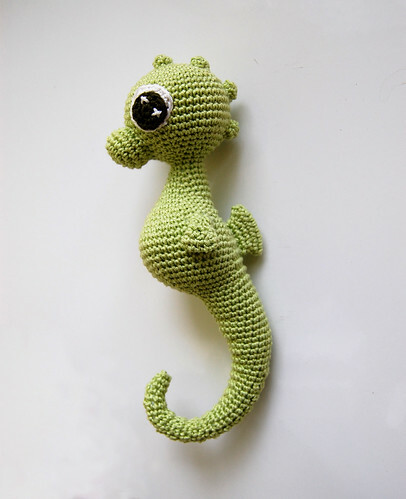 So, your little seahorse will be the size you choose, go with bigger yarn and a bigger hook and you will get a bigger seahorse. If you decide to go smaller, of course your Charly will be smaller, as easy as this right? the decreases created a bending in the snout which resembles the top of the snout. Now place the snout to the head in a way that the bended end is on top and the flat end is at the lower side. Use pins to fix the snout in place before you sew it to the head. To sew the snout to the head use the BO yarn end. Secure yarn ends and hide within the seahorse. make about 4 (or as many as you like) and add them to the head, all centered and lined up in a row, sew to head, secure and hide yarn ends. Sew to lower back, opposite to belly, below bending of back and above beginning of tail (see front picture). Secure ends and hide them. Sew to side of body, one thumb wide away from dorsal fin. Secure and hide yarn ends. Embroider little sparkles onto the dark pupil parts of the eyes. See figure below for guidance. The figure also shows you how to sew both parts of the eye together. and that’s it — I hope you enjoyed this mygurumi pattern as much as I do. It’s still one of my favorites! Sew to body, maybe onto the belly? Or how about right behind one eye? Hi, I love this pattern! when do you stuff it? do you do the head half way down the body? What works best? I know this is an old pattern, but where is it? This post says its free, but when i scroll down there is nothing there :’-( And the seahorse is soooo cute! The head, body and tail is almost done. I have a question about row 90. It says: sc2. Row 90 says: sc2. Maybe you mean to sc2tog x3 because after row 89 I have 6 stitches left. Thanx for replying so quick. We Will follow your directions. This pattern is very confusing. I think using the term m2 and all the brackets and x 6 is crazy when it can be something as simple as 1sc, increase (18) or 2sc, decrease (18). Makes for an easier pattern. Because of the instructions I cannot make the pattern without rewriting it. It’s too bad. The seahorse is really cute. I’m sorry to confuse you. Unfortunately the pattern does not work the way it does if you increase or decrease a stitch anywhere you like. This is exactly the reason why I write my patterns as I do, there is some very precise shaping included. What an amazing pattern! Quite challenging for begginers I must say but I almost made it! For example in the dorsal How can it be shifting from 11 st (line 2) to 16 st (line 3). This seahorse pattern worked up so well. I love the finished product. It is one that requires attention while making though. Thank you for making this a free pattern. Can you give the explanations? Very challenging pattern but i did get thru it! Ran out of body color at row 83 so i ended & just closed off tail. He is very cute. I had a little trouble doing a sc in a slst, but got it done. Made the shaping so nice! I used a #3 cotton thread & a 00 hook, body is dk green & add ons are light blue. Very cue. I love this pattern, it is so qute! The head/body/tail is finished, but the snout isn’t looking like it has to. Do you crochet the snout in only back loops or something else? Mine is too big and isn’t decreasing/increasing the way yours is.. In row 61 itvsays esc4, I read the meaning for esc but not for esc4, and nomatter how do this, my stitch count for row 62 is off by 3 acai can only add 7 a.c. not 10. What am o doing wrong? ok, I figured it out, but it was 2am when I got to row 76 and so I decided to stop the tail there for my first attempt at this pattern. My little girl turned out super cute! Ill try to send pics in an email!